Getting selfie photo will be easier with B612 APK 4.8.3 because interesting feature and advanced filter make good result on photo. This app is camera-based type so you have to install in proper Smartphone or tablet to get exciting photo. Selfie grow into popular culture that people try to create something innovative with their photo. In selfie, you focus on certain angle then capture immediately. Since it is taking photo on yourself without helping friend, this process is a little bit difficult. Instead of good photo, you will get annoying result that cannot be shared to social media. Developer of B612 understands how important selfie is in modern era, which everyone tries to make the best photo to share on social media. Standard camera on Smartphone is not intended for this purpose. You have to get app that help to capture in precise angle then edit into better appearance. B612 offers what people have in mind about selfie with many filters to increase attractive photo then advanced feature such as sharing mode. After you are done editing photo, this app will help you to spread selfie photo to popular social media. Users just tap into app icon then several setting appears to adjust with camera. Another feature in this app is video clip with sound. 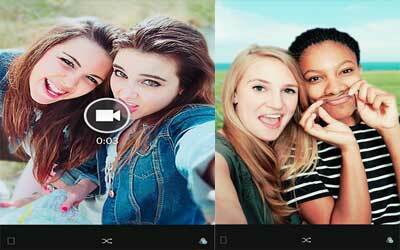 It is putting one folder that contains your selfie photos then arranges them into video. To make it looks elegant; user can add sound or song and using some filters to make the best final result. When taking selfie, people worry about sound when tap screen, this problem is no longer available because you can do selfie without everyone knowing. The next feature is auto-focus and face recognition to capture photo accurately. Therefore, B612 for android is the best camera application to make selfie something pleasurable. Collage shot: Show everyone a glimpse of your universe by putting your smiles together into one photo. Create 3D pictures that stand out with this feature.